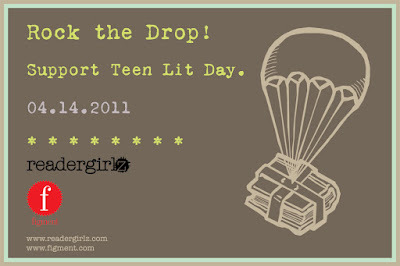 AuthorMitaliPerkins: Rock The Drop 2011! Download the banner above, created by David Ostow (who blogs hilarious cartoons here), and add it to your website or blog, linking back to this post on readergirlz, and proclaiming that you will indeed ROCK THE DROP! Print a copy of the bookplate below and insert it into a book (or 10!) that you'll drop today in a public spot (park bench, bus seat, restaurant counter?). Take a photo of your drop and email it to readergirlz AT gmail DOT com — pictures of drops happening all over the world will be posted at the readergirlz blog, and the amazing folks at Figment will also be featuring the event. Can you imagine people around the globe finding copies of amazing books in unexpected places, given in honor of great stories for teens?